Gluten free birthday? No problem. Don't let some of the dry commercial gluten free cakes fool you! 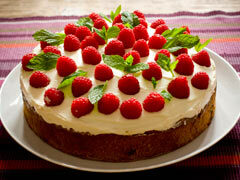 Light, moist gluten free cakes are very easy to make. Just choose a good recipe with good ingredients. Why not ask someone to make you a cake for your next special occasion. Christmas cake? Why not just make a big gluten free one for the whole family?